The new Nisi V6 Filter Holder is the next evolution of the now renowned filter holder introduced by Nisi, the V5. We listened to our users and introduced new features whist refining other features to deliver our most advanced filter holder yet. The V6 still incorporates the main features of the V5, with a main Adapter Ring accepting an included ultra slim polariser, turned by cog wheels on the outside. 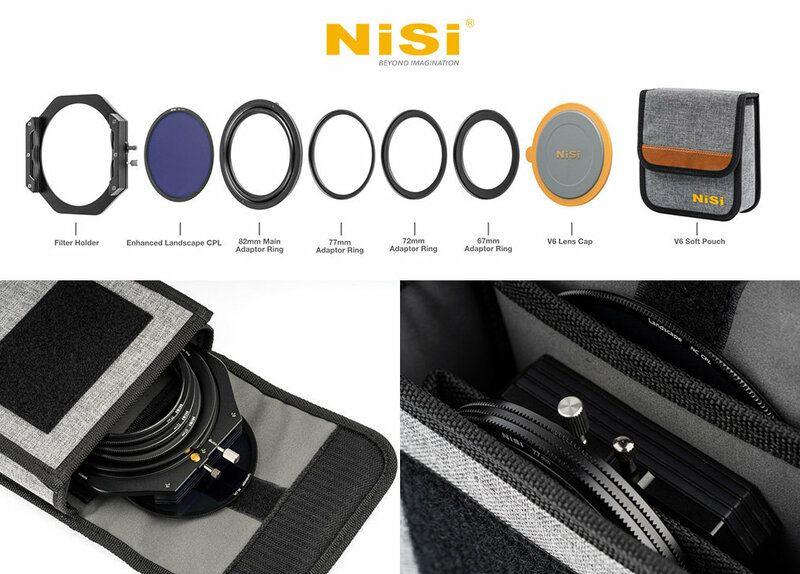 Nisi invented the principle of the Adapter Ring/CPL combination and it brings huge benefits; no need to mount the filter frame when just using a polariser, and it is completely light sealed to prevent reflections from the rear. The shape has changed. Still made from aviation grade aluminium, corners are angled to make ND filters much more accessible, which makes the holder more compact. The internal diameter is the same meaning it can be used with no vignetting on 16mm wide (full frame equiv) lenses. By reducing the holder to 2 slots it can even be used on the new Nikon Z 14-30S with no vignetting. Rails have been refined, whilst being shorter to accommodate the new shape they now have a full length guide to ensure filters slide in easier. 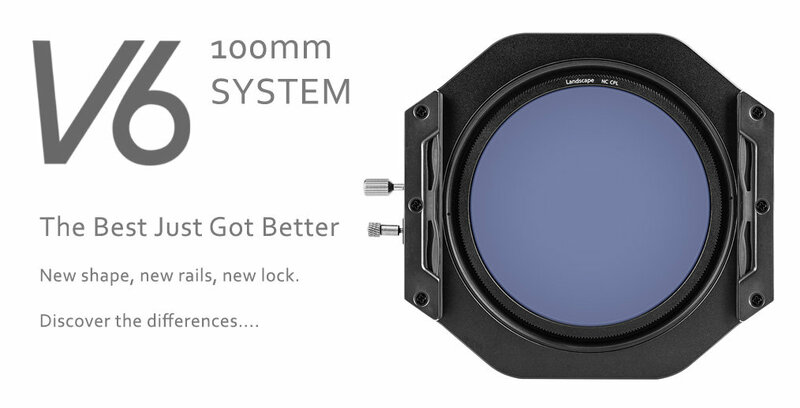 A 1mm lower profile futher reduces any chances of vignetting on ultra wide lenses. A feature request, we introduced a lock pin. Whilst the mounting pin means the holder is securely attached to the adapter ring, a new lock pin allows the holder to be locked in any angle for precise alignment of filters and further security when carrying your camera. The main adapter ring has been refined to allow fitting of a brand new cap, now easier to fit and remove. The hard shell centre protects the CPL, with a softer outer ring for easier removal. The CPL has also been raised slightly to aid removal. Our design styling for new cases has been carried though to a new V6 case. It accommodates the full V6 kit, including adapter ring, lens rings and polariser. Please visit the Shop to purchase today.